What is the Green Ontario Fund? The Green Ontario Fund is a not-for-profit provincial agency that invests proceeds from Ontario’s carbon market into climate actions that help people and businesses reduce greenhouse gas emissions and use cleaner technology to power their homes and workplaces. Measures the rate of heat loss through glass and other products. The lower the U-Value the better the insulating qualities of the glass which will reduce heating costs in the winter as well as keeping the interior glass surface warmer which will reduce the likelihood of any glass condensation. What is the GreenON Rebate Program? In mid-December, the Ontario government launched a new program offering rebates on the purchase and installation of select high-performance windows. This program, called GreenON, was created to promote the reduction of energy costs and fight climate change. It offers $500 per window replacement, and up to $5,000 per house. Available for single homes, semi-detached and townhomes already built (not on new construction). Available on full-frame installation only (no retrofit installs allowed). Bay and bow windows are eligible (but a bay/bow counts as 1 opening). Registered Heritage homes: GreenON is working on the parameters of the program. Who is Eligible for this Rebate? You must be an Ontario Resident. You must live in/own a detached home, semi, or townhouse to be eligible for GreenON Rebates. Renters must have the written permission of the owner/landlord. Windows must have a total installed cost of at least $500 each. Windows must be bought and installed by a Window Wise certified installer. The Window Wise installers can be sub-contracted out providing they are Window Wise certified. The Window Wise Dealerwho sub-contracts the installation must have a Showroom. Certification is not retroactive therefore if the installer is not certified at time of installation, the rebate will not be given. The installer/dealer is responsible for submitting the GreenON rebate claim. Must have a HST registration number and either a Master Business License or Articles of Incorporation valid for at least 2 years. $2 million in liability insurance. $1 million in automotive insurance. A letter of clearance from the WSIB (Not required for sole proprietor). Evidence of current certification by Window Wise. Homeowners must take before and after pictures of each window to submit with the application. Only one application per property. All windows must be bought and installed at the same time. If the Enbridge or Union Gas program has already been used on the house, the GreenON program is not applicable. Homeowners will receive a cheque from the government 8-12 weeks after the application is sent. 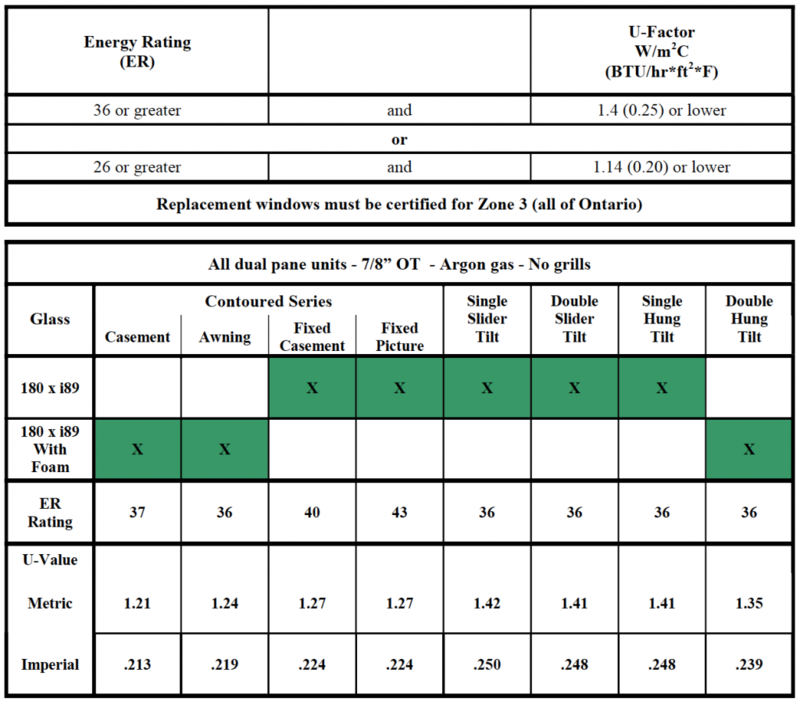 Both ER value and U-factor requirements must be met and on the window label.